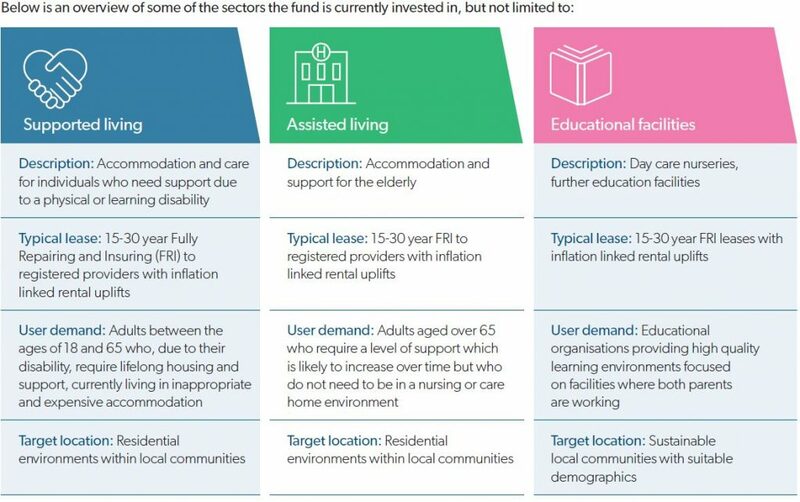 Investor consent to exchange units in SFF (and its dedicated feeder trust, SFFT) for equivalent units in a new FCA authorised fund, Social Long Income PAIF (“SLIP”) (and its dedicated feeder trust TIME:Social Long Income Feeder Trust (“SLIFT”) was approved on 22 March 2019. For more information, click here. TIME:Social Long Income has been launched to provide investors with consistent income while also creating a positive impact on society. The fund aims to deliver a secure, stable income with a level of inflation protection, by investing in a diversified portfolio of social infrastructure assets. investing in assets that provide a meaningful social benefit in return for long leases. The long lease lengths provide peace of mind for the tenants, helping them forecast future budgets and ensure ongoing support for those using these facilities, as well as also providing the fund with consistent income. Rents are typically linked to inflation providing security of income. TIME:Social Long Income offers dealing in its shares on daily basis with distributions paid on a quarterly basis. The payment dates for the distributions will be the end of March, June, September and December. TIME’s income solutions have a long track record of delivering attractive inflation-beating returns with consistent income. The TIME group manages over £3 billion of assets and has a long and impressive track record in long income investing. TIME managed funds have offered consistent stability throughout economic and stock market cycles, providing continuous liquidity for our investors. TIME:Social Long Income is part of a suite of three successful long income funds. For full details of the risks associated with TIME:Social Long Income please read the product brochure, prospectus and application form.